International departure taxes of $102 plus current fuel surcharges of $320 are included (subject to change). We depart Pittsburgh to connect with our overnight flight to the Emerald Isle. We enjoy in-flight movies, dinner and breakfast aloft. This morning, we arrive in Dublin where we are met by our Unitours driver/guide who will remain with us for the duration of our pilgrimage. We journey straight to Armagh, the spiritual capital of Ireland for 1500 years, famous for its two St Patricks’ cathedrals, Catholic and Anglican. We celebrate Mass at St. Patrick’s Roman Catholic Cathedral in Armagh and hear the history of this impressive building. The interior looks Byzantine; the walls and ceilings are covered in colored mosaics. We also enjoy a walking tour of the Anglican St. Patrick’s Cathedral. Dinner and overnight in Armagh. Today after our Irish breakfast we travel to Belfast. We enjoy a panoramic tour ending at the famous St. Malachy church where we celebrate Mass. Our tour includes a stop at Shankill and Falls roads where we will learn about past strife and view the political murals, plus a stop at the Europa Hotel, the most famous hotel in Belfast. We continue to the Titanic museum, a salute to Belfast’s maritime heritage. We uncover the true legend of the Titanic, while exploring the shipyard where the ill-fated ship was built. 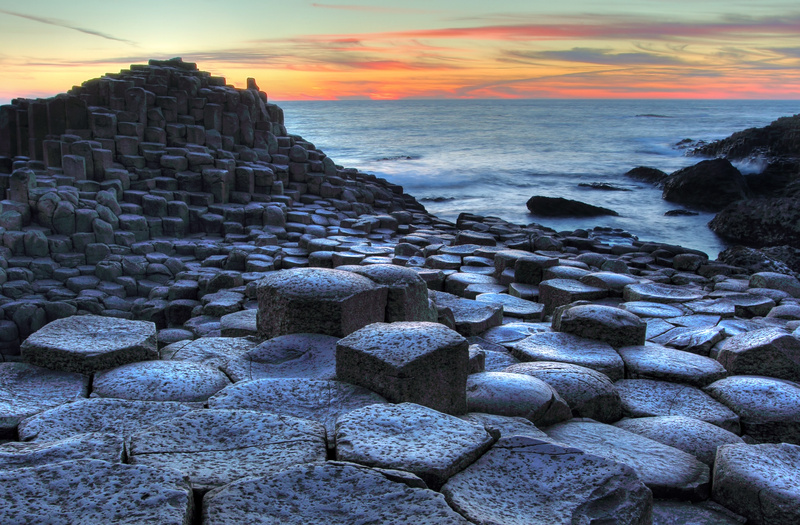 After some free time for lunch we depart for the Giant’s Causeway- one of the most spectacular natural spots in the world and a UNESCO world heritage site. We return to Armagh for dinner and overnight in the City on Seven Hills with two Cathedrals. This morning we leave Armagh for Knock, to visit the famous Marian Shrine, internationally recognized and important pilgrimage center. Knock Shrine is renowned as a site of visions, apparitions and miraculous cures. In August 1879, fifteen people witnessed the apparition of the Blessed Mother, St Joseph and St John the Evangelist at the south gable of the Knock parish church. St Pope John Paul II visited Knock in 1979, during the centenary of the apparition. Pope Francis also visited during the World Meeting of Families in 2018.We celebrate Mass here and enjoy some free time for personal prayer. We continue to Galway, a city on Ireland’s west coast. We enjoy a brief panoramic tour of its delightful narrow streets, old stone and wooden shop fronts, Spanish Arch, the 19th century Eyre Square, the Latin Quarter and Lynch’s Castle. Next to the castle is the Collegiate Church of St. Nicholas, Galway’s finest medieval building and where Columbus is said to have prayed before setting sail for the Americas. Enjoy some free time to explore the city. Dinner at a local restaurant in Galway. Overnight Galway. Today we visit the Cliffs of Moher celebrating Mass en route at St. John the Baptist church. The Cliffs of Moher, situated in the Atlantic Ocean, boast one of the most spectacular views in Ireland. On a clear day, the Aran Islands are visible in Galway Bay as well as the valleys and hills of Connemara. We visit O’ Brien Tower, north of the Cliff’s highest point, then the Atlantic Edge, and its exciting new interpretive center. We pass the Burren National Park, a unique place with limestone pavements, myriads of wild flora, megalithic tombs and Celtic crosses as well as a ruined Cistercian Abbey dating back to the 12th century. Time permitted we stop at the Holy Well of St. Brigid where testimonies to lost loved ones fill your spirit with hope. We continue with our journey to Tralee via a ferry from Shannon. Dinner and overnight at our hotel in Tralee. This morning we wake in beautiful Tralee, in County Kerry. Saint Brendan, one of the early Irish monastic saints and one of the Twelve Apostles of Ireland, hailed from this area. We visit nearby Castleisland to celebrate Mass at St. Stephen and John Church, where Father Terry’s great-grandfather was baptized. We then head to Dingle. We enjoy free time to wander the streets of Dingle, shop and have lunch. We sightsee some of the Dingle peninsula before we head back to Tralee. Tonight, upon returning to Tralee, we eat out at a Tralee restaurant with local flavor. Today after breakfast, we journey to St. Mary’s Cathedral in Killarney to celebrate Mass and then enjoy a brief visit of this picturesque town. We then drive down to the Ladies View on the Ring of Kerry, including a short walk to the Torc waterfall, departing for Blarney Castle! Over the past several hundred years, millions of people have flocked to Blarney Castle to kiss the Blarney Stone- making it a world landmark and one of Ireland’s greatest treasures. The legendary Stone of Eloquence, found at the top of the tower, if kissed, legend says it delivers the gift of eloquence! We continue to the Rock of Cashel, known more formally as St. Patrick’s Rock, hailed as the site of the conversion of Aenghus, the King of Munster, by St. Patrick in the 5th century. Dinner and overnight in the Cashel area. Today before departing for Dublin, we visit and tour beautiful Holycross Abbey. The church has many interesting features including a variety of fascinating windows, mural paintings and many fine carvings. We celebrate Mass here before departing for Dublin! En route we pay homage to St. Kevin, the son of royalty and one of Ireland’s most popular saints. We visit the Glendalough Monastic site founded by St. Kevin in the 6th century which later became a famous center of learning throughout Europe. St. Kevin’s has attracted pilgrims and those with vocations to religious life for centuries. 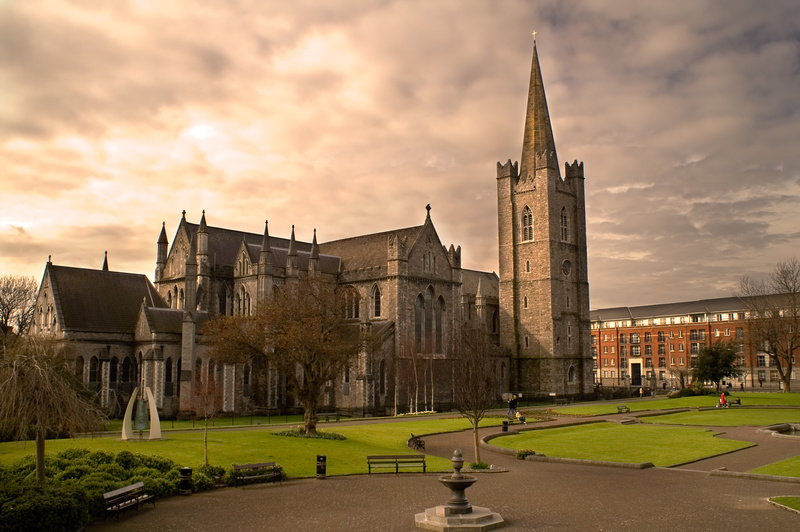 We continue to Dublin, where we will have a driving tour of her sites, including St. Mary’s Cathedral, before arriving at our hotel for dinner and overnight. Today we start our day at Whitefriar Carmelite Church to see the relics of St. Valentine and celebrate Mass. Then we tour all the sites of Dublin with a local guide, including a visit to Trinity College, to view the Book of Kells. We visit the National Museum of History which contains many of the Holy relics of Ireland. We enjoy some free time for lunch and shopping in Dublin this afternoon. You may also like to visit the Guinness factory. Tonight, we celebrate our pilgrimage with a special dinner at the Merry Ploughman’s Pub. Overnight at our hotel in Dublin. Today we enjoy our last hearty Irish breakfast and then head for the airport for our flight home. We will carry the stories of the Saints and the beauty of the Emerald Isle in our hearts forever and, of course, we will have the gift of eloquence!